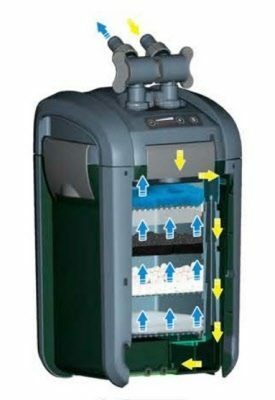 The PRO-35 4 Stage Canister Filter features a variable flow 24 Volt DC Pump, and a shut off valve for fast disconnect, quick lid removal, and easy upkeep. JBJ's Reaction Pro series provides a revolutionary solution in filtration for your aquarium. 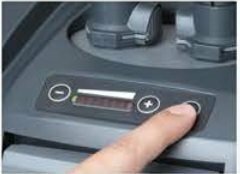 The Instant Push Start Button and Flow Control buttons includes a convenient setup and operation. 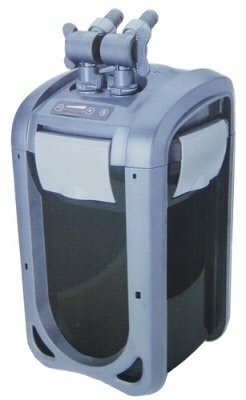 With its big, easy to remove filter baskets and its integrated UV Sterilizer, the Reaction Pro Series is the choice for saltwater or freshwater aquariums. Similar to the EFU series, the PRO-35 utilizes ultraviolet light, biological, and mechanical filtration to keep your water crystal clear and safe for your fish and corals.